Thanks to Dr. Ramesh Dharawat for a discussion on two recent cases seen at SJGH. One patient presented with a pericardial effusion and the other presented with what was thought to be ventricular tachycardia. Pericardiocentesis should NOT be routinely done for diagnostic purposes. Indicated for hemodynamic compromise as seen above. Medication can lead to pericardial effusion as seen in the patient that presented to the hospital. Some medications implicated: hydralazine, minoxidil, procainamide. The patient was on minoxidil. However, this is not VT. This is SVT conducted with aberrancy. Here’s some ways to help differentiate between VT vs. SVT conducted with aberrancy when you see a wide-complex tachycardia (WCT). This patient had SVT conducted with aberrancy and not VT. However, it is still important to assume VT in WCT until proven otherwise. 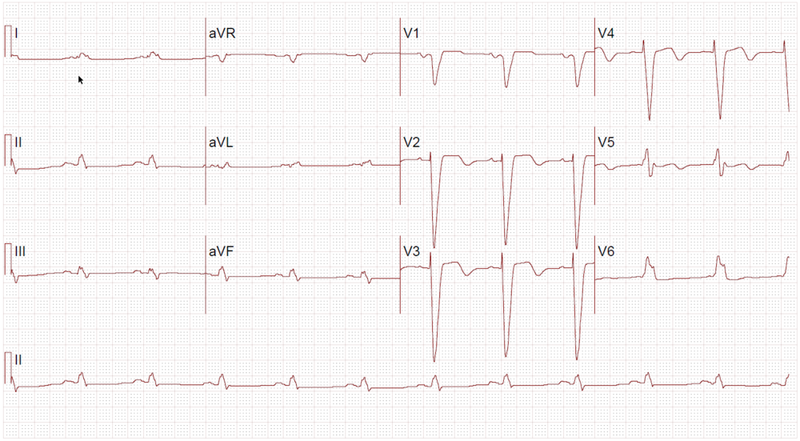 It is helpful to check prior EKGs if the patient is stable. If unstable, use electricity. Thanks to Dr. Nathan Blau for presenting on Cardiac Hypertrophy. COPD, hypertension, athlete, history of volume overload, history of pressure overload, etc. What voltage criteria do you use for LVH? The oldest and often most used criteria is the Sokolow-Lyon Criteria. No single criteria is perfect.